Eggless tutti frutti cake is a delicious and fluffy cake without eggs, which can be made during this festive season. No festival is complete without cakes. This Raksha Bandhan, bake this special eggless tutti frutti cake for your brother. This eggless tutti frutti cake is made with whole wheat flour which makes it a healthy option when there will be rich sweets during the festive season. For more such exciting recipes like eggless tutti frutti cake, please click on the following links. Add butter and sugar and whisk till sugar dissolves. Sift flour, baking powder, baking soda 4-5 times. Add this flour mix to butter sugar mix. Mix well. Add 1/2 cup Tutti Fruity. Mix well. Grease a baking pan. Add this mix to pan. Top with 1 tablespoon Tutti Fruity. Bake @180°C for 30 minutes. 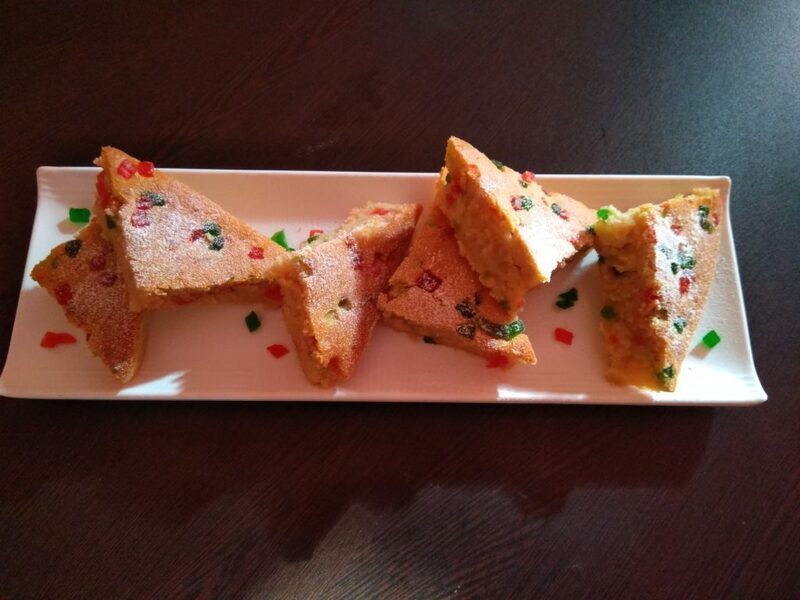 Let it cool and enjoy eggless tutti frutti cake with your siblings.